The regional pouring ended at 6:00pm on the 28th of January. 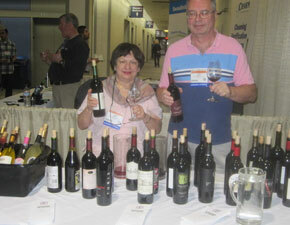 The Atlantic Seaboard Wine Association pouring station was surrounded by attendees throughout the two hour session. This is a view of the pour station along the crowed convention center as the pouring session ended. The Atlantic Seaboard Wine Association team represented by its President, (left) Carl Brandhorst and it’s West Coast Representative (Center) Ms. Anne Vercelli, are joined at their Unified tasting booth by Darrell Corti(right), of Corti Brothers in Sacramento, CA. Darrel has a deep interest in east coast wines and finds this a super opportunity to sample some excellent examples of wines from the Atlantic seaboard. Ms. Vercelli is holding a wine from Martha Clara Vineyards Winery located on Long Island in New York State. Atlantic Seaboard Wine Association, President, Carl Brandhorst, getting ready to pour a second New York wine at the Unified regional wine pouring, a sparkling wine from Chateau Frank from the Finger Lakes region in New York state. The wines in front of Carl are all waiting to be poured for the event. The President of the Atlantic Seaboard Wine Association, Carl Brandhorst, at the Association’s tasting booth during the regional pouring highlighting a wine from New York’s Long Island area, Martha Clara Winery. 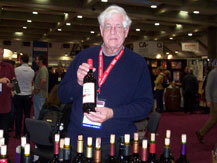 The Association’s booth was in the center of the Convention Hall and Carl is surrounded by attendees waiting to taste some east coast wines. The wines are ready to be poured. The Unified Wine and Grape Symposium is the largest trade show in North America and is held annually in January in Sacramento, CA. This year it was held 27-29 January 2015. 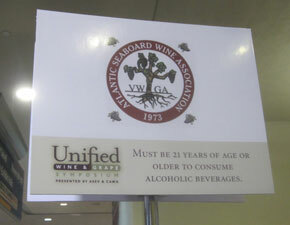 The Atlantic Seaboard Wine Association® (ASWA) has attended the Unified Wine and Grape Symposium for many years. ASWA attends in order to keep up to date on trends in the wine industry and to keep abreast of developments in legislation so that it can focus its efforts in the most effective manner in support of wineries. 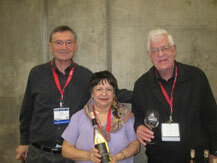 Each year the association has poured east coast wines in the regional wine pouring session at the Unified. This year on January 28th (2015), as usual, ASWA poured 24 different white wines and 24 different red wines all representing a broad range of wines from eight (8) of the states from the Atlantic Seaboard Wine Association’s® 10th annual wine competition. The list of wines poured is below. The President of ASWA, Carl G. Brandhorst, was assisted by Board Member, Grant Crandall and ASWA’s West Coast Representative, Ms. Anne Vercelli, of Healdsburg, CA in the pouring and in answering questions about the wines. This effort is an attempt to promote east coast wines as a quality wine producing area. ASWA is an associate member of the California Association of Winegrape Growers (CAWG). Several notables dropped by the station on the main convention floor during the pouring hours. Rob Merletti, CEO of Vineyards and Winery Management magazine as did Darrell Corti a wine and food judge and culinary aficionado whose store in Sacramento, Corti Brothers, is famous for its wide selection of food and wines from around the world. Here is the Atlantic Seaboard Wine Association ( ASWA) team at the Unified’s regional pouring event on 28 January 2015. ASWA Board Member Grant Crandall (left), Ms. Anne Vercelli, ASWA’s West Coast Rep ( Center ) and ASWA President,Carl Brandhorst X(right). 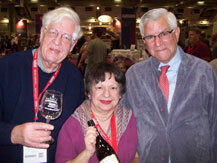 Ms. Vercelli is holding a bottle of Harvest Ridge Winery’s ( Delaware)d Vidal Blanc. Harvest Ridge is a new winery in Delaware and just opened a year or two ago. The three team members poured 48 different wines ( 24 white and 24 red) for the two hour period of the regional wine pouring. The team answered many questions on the different grape varieties being poured and questions on the individual wineries represented. 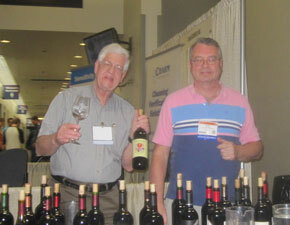 Atlantic Seaboard Wine Association, Board Member Grant Crancall ( left) and ASWA President, Carl Brandhorst (right) at their pouring station on the main floor of the convention center at the Unified Wine and Grape Symposium regional pouring on the 28th of January 2015. They were pouring 48 different wines from eight (8) states and thirty-seven (37) different wineries for attendees at the trade show. At the end of the two hour pouring period ( 4:00-6:00PM) most of the bottles were empty as there was a flood of tasters. The white wines are being chilled on the left with the red wines on the right. Atlantic Seaboard Wine Association (ASWA) Board Member, Grant Crandall on the left and ASWA West Coast Representative, Ms. Anne Vercelli on right with Mr. Darrell Corti in the center. 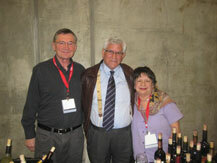 Mr. Corti dropped by to taste a variety of east coast wines. 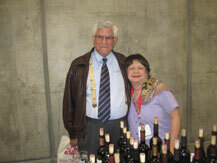 He is always searching for wines for his store famous for its wide selection of foods and wines from around the world. The Corti Brothers Store is located in Sacramento. Darrell Corti from Sacramento with Atlantic Seaboard Wine Association’s West Coast Representative, Ms.Anne Vercelli of Healdsburg, CA Mr. Corti knew Ms. Vercelli’s father, Joe Vercelli, one of the very early wine-makers in Sonoma and a recognized pioneer in the California wine industry. 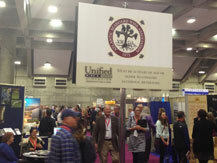 The Unified Wine and Grape Symposium is the largest trade show in North America and is held annually in January in Sacramento, CA. This year it was held 28-30 January 2014. The Atlantic Seaboard Wine Association® (ASWA) has attended the Unified Wine and Grape Symposium for the last several years. ASWA attends in order to keep up to date on trends in the wine industry and to keep abreast of developments in legislation so that it can focus its efforts is the most effective manner is support of wineries. 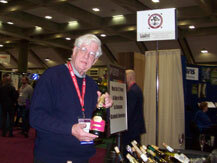 Each year the association has poured east coast wines in the regional wine pouring session at the Unified. This year on January 29th (2014), as usual, ASWA poured 24 different white wines and 24 different red wines all representing a broad range of wines from eight (8) of the states from the Atlantic Seaboard Wine Association’s® 9th annual wine competition. The list of wines poured is below. The President of the ASWA, Carl G. Brandhorst, was assisted by Vice President David A. Barber and ASWA’s West Coast Representative, Ms. Anne Vercelli, of Healdsburg, CA in the pouring and in answering questions about the wines. This effort is an attempt to promote east coast wines as a quality producing area. ASWA is an associate member both of the Family Winemakers of California and the California Association of Winegrape Growers (CAWG) who hold their annual membership meetings during the Unified. 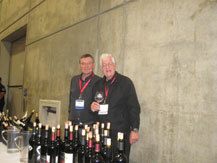 ASWA President, Carl Brandhorst on the left and ASWA Vice President, David Barber on the right at the ASWA pouring station at the Unified Wine and Grape Symposium during the regional pouring event in the Sacramento,CA convention center on the 29th of January 2014. Ms. Anne Vercelli, the ASWA West Coast Representative (left) and ASWA Vice President, David Barber (right) pour wines from the 9th annual ASWA wine competition reflecting a broad range of wines from the Atlantic seaboard. The competition covers 17 states from Maine to Florida and wines from 8 states were represented at the pouring on the 29th of January 2014 in the Sacramento, CA convention center.